Gut bacteria revolting | Now What? I am fascinated by the notion that my body is simply a cosmos for supporting my bacteria. 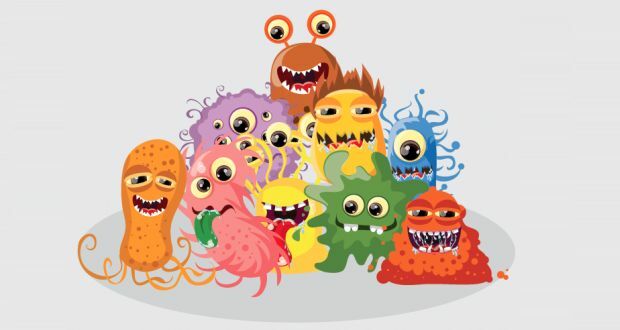 When I read that our gut flora may be affecting our behavior, I started feeling a warm fuzzy feeling about my microbes. Especially when I watched this cute little NPR animation: http://www.npr.org/templates/event/embeddedVideo.php?storyId=244526773&mediaId=245227995 . So now, if my GI system seems a bit off, I think of it as my gut bacteria trying to communicate with me. So I ramped up my summer regimen of radically changing from the XXL Peanut M&M’s to blubes, salads and cherries, only to have my junk-food loving gut bacteria start to bellyache, gripe, and raise a stink. They immediately began picketing (with sharp sticks, I could tell), carrying signs like: “Sugar YES, Fiber NO!” and “New Dietary Practices Unfair to the Masses!” I could feel the rumblings of revolution. In fact, for a day or two, we had outright war, with Kamikaze bugs becoming flushed with fervor. Quite a few bombs were detonated. Well in order to calm the waters, I needed to give the fruit-troops time to grow, so I continue to eat fruit, but in much smaller quantities. And sure enough, as balance is achieved, things are settling down. What I’m hoping is that they will learn to live in harmony and quit all this ferment. But I’m there to listen. And obey.